Croxden was a late Cistercian abbey founded by Bertram de Verdun, lord of Alton, a baron of the exchequer and a royal justice. The purpose of the foundation was for the salvation of the souls of his mother, of himself, of his second wife Rose, and of Richard de Humez. (1) In 1176 he granted land at Cotton (formerly spelt Chotene or Chotes) to the monks of Aulnay-sur-Odon in Normandy as the site for a new abbey. The first monks from Aulnay arrived in 1176 but within three years had moved to a new site at Croxden, a few miles to the south. The house was styled the abbey of the Vale of St. Mary at Croxden and although the abbey was dedicated in 1181, the construction of permanent buildings was slow. (2) Whilst the community was French, the first abbot, Thomas, was an Englishman. He ruled the abbey for over fifty years, during which time most of the buildings were completed. (3) The site was fairly compact and there appears to have been no more than twelve monks living at the monastery throughout its history. The thirteenth and early fourteenth centuries were a time of prosperity for the abbey, with much of the monastery's profits drawn from sheep farming, a typical occupation of the Cistercian communities. Problems arose during the fourteenth century when the last of the Verdun family died and patronage passed to Joan, the eldest daughter and her husband, Thomas de Furnivalle. Thomas was particularly heavy-handed in his approach towards the monks, impounding animals and confiscating property. In response, the monks erected a thorn fence and barricade to prevent Thomas from entering their site. The dispute was finally settled with the aid of some local magnates and peace was restored. The mid/late fourteenth century brought with it more serious economic problems: royal exactions were increased, and plague, floods and bad harvests all contributed to the impoverishment of the abbey. 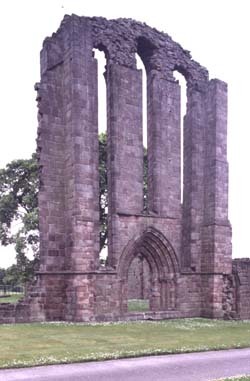 The decline was reflected in a decrease in numbers and in 1377 and 1381 only an abbot and six monks inhabited the abbey. (4) The abbey never recovered its former prosperity and in 1535 the gross annual income of the abbey was assessed as £103, and thus should have been dissolved in 1536 with the lesser monasteries. However, in 1537 the abbey received a licence to continue for a fine of £100 but was surrendered only a year later by the abbot and twelve monks. (5) The site contained a large mill pond and dam, although this area is now crossed by a road. The plan of the abbey was copied from the mother-house of Aulney-sur-Odon and so was more elaborate in design than most Cistercian churches in England. (6) There are substantial remains of the church and claustral ranges and a detached abbots house. A Georgian farmhouse now occupies the site of the abbey kitchen and its driveway slices through the old west range. The precinct is clearly defined by earthworks, and retains a late-medieval barn which is still in agricultural use. (7) Croxden is in the care of English Heritage, and contains more remains than any other monastic site in Staffordshire. The area is open to the public at all reasonable times.